After developing videogames for more than a decade, our studio finally embraced Agile methodologies as a project management approach. For years we had been tumbling down the waterfall cramming tasks into bloated project management software that was better suited for building tax preparation programs than action-adventure games. When we finally joined the Agile revolution It was like Dorothy stepping into Oz; the world suddenly changed to technicolor and anything seemed possible. Agile development methods come in many flavors such as Scrum, Kanban, and Lean, but at the core Agile for game development is about iterating on features to find the fun, freeing your team from rigid documentation demands that tend to lose the forest for the trees (so many trees for all those 300-page design documents), responding to change as it occurs, and empowering team members to collaborate and feel ownership of the project. Unfortunately, when we first started, project-planning software couldn’t keep up with our Kanban approach. We filled the walls of our conference rooms with columns made of string to separate our project backlog from features in progress and those that were completed. We put thousands of tiny holes in the wall with push-pins holding up color-coded index cards. A card for every feature, a color for every category, and heaven help us if a card fell off the wall and the cleaning crew swept it into the trash bin of forgotten features. While playing with string and push pins was kind of fun, there had to be a better way. That’s why we were overjoyed to find Favro, a streamlined project management platform built specifically for Agile teams. Even better, Favro is made by Hansoft, a company that has been the gold standard of game dev project management software for a decade. Founded by game developers, Hansoft incorporates the features the industry demands with a great user experience game makers really appreciate. Favro is cloud-based and offers powerful planning features and a clean, simple interface that replicates the look and feel of the classic Kanban board. 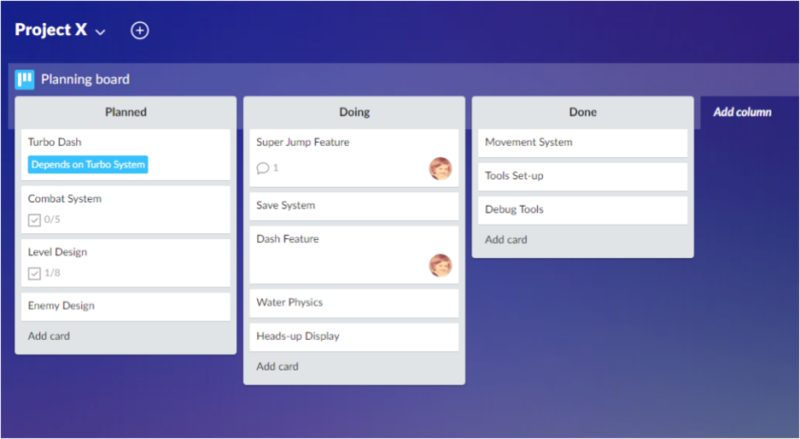 You create virtual cards for each feature and place them in columns: one for “Planned” features, a “Doing” column for features in progress, and a “Done” column for completed work. Columns are fully editable and you can add as many as you need for additional development stages. Dragging features from column to column is simple, and the whole team can view and update the board, communicate, and iterate quicker. This captures the power and flexibility of Agile project management without the downtime. This power and flexibility extends to the cards as well. Cards have a number of fields you can edit for each feature. Beyond simply assigning work to team members and scheduling start and due dates, you can associate files, create task-lists, and tag features. Searching by tags allows you to find all the features and tasks associated with that term, a really powerful organizational tool. You can also maintain multiple backlogs for different projects or studio responsibilities like hiring or securing new projects. 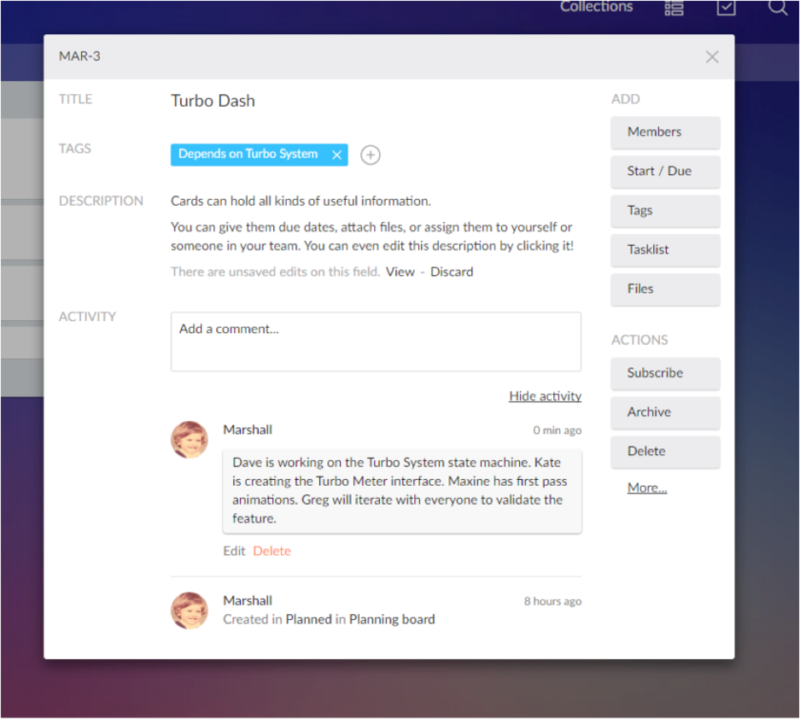 Every team member has their own checklist, and the recent activity system generates a newsfeed of recent activity and a list of notifications. This is a great way to get a quick snapshot of the state of your project. But I think my favorite feature in Favro is the activity field where team members can share questions, suggestions, work status updates and more. Each comment is timestamped, allowing you to keep a running record of the feature’s evolution. This puts discussion on a feature in one place and alleviates the annoyance of having them scattered around email threads and chat logs. Favro offers a suite of reports and an app store to connect with file repositories and communication tools like Dropbox, GitHub, and Slack. Ultimately, Favro’s best feature may be its simplicity. The interface is clean and easy to use, the feature-set is tight, and within minutes the whole team can be up and running and making great games.